The delegate of the Qurultay of the Crimean Tatar people noted that the researchers "date the calligraphy mural painting from approximately 1747-1764 years"
In the occupied Crimea, the so-called "reconstruction" of the Khan Palace in Bakhchysarai continues, according to the ex-Head of the Republican Committee of the ARC on interethnic relations and deported citizens, and the delegate of the Qurultay of the Crimean Tatar people Edem Dudakov. “And again the Khan Mosque and another act of Vandalism. Vandals installed and propped up the scaffolds right on the mural of the 18th century on the eastern facade of Han Cami (from the side of Sara Gul Hammam),” he wrote. Dudakov noted that the researchers "date this calligraphy painting from approximately 1747-1764 years". It was cleared by Kyiv restorers with special composition remover in 2002. QHA reported that on 25 February, the occupiers in Crimea detained a 28-year-old Crimean Tatar female activist Elmaz Akimova, who went to a one-person picket in defense of the Khan Palace. Earlier, a lawyer and human rights activist Rustem Kemilev filed an application to the Central Investigation Department of the Criminal Investigation Service of the Russian Federation in the occupied Crimea regarding the crime of destroying the Khan Palace in Bakhchysarai under the guise of restoration. 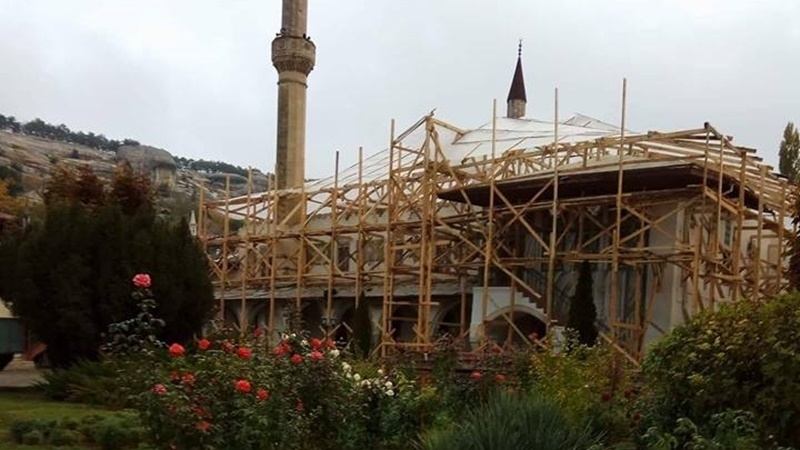 Kemilev noted that in the course of the “restoration work" elements of cultural heritage - wooden roof structures, joists, cross beams were destroyed.